Now that you know how to take gifts through security, you may be curious about how to transport all those other winter items such as home-baked goodies, that Santa outfit you’ve been dying to wear, or bulky ski equipment. To be honest, the days of baking a pie before flying to Grandma’s house are long gone (that is, unless the pie weighs less than three ounces or can be packaged well enough to survive being checked). I recommend leaving baked items at home, or possibly shipping them ahead of time. This shipping sentiment also goes double for any decorations or costumes you may want to pack, as it now costs quite a bit to bring extra luggage. If you must travel with extra baggage, get a sense of applicable fees by reading our guide to airline fees chart. As for packing winter sporting goods, you will end up paying a bit extra for a snowboard or a pair of skis now that most airlines charge fees for checked bags. 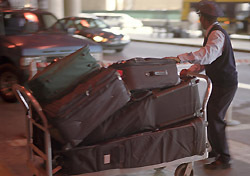 However, as long as the items aren’t too heavy, it’s cheaper to fly with them than ship them. Lastly, it’s always wise to check with the TSA website to know what you can and can’t bring before you start packing. Do you have any suggestions on ways to get around traveling with winter items? Please share your comments below.